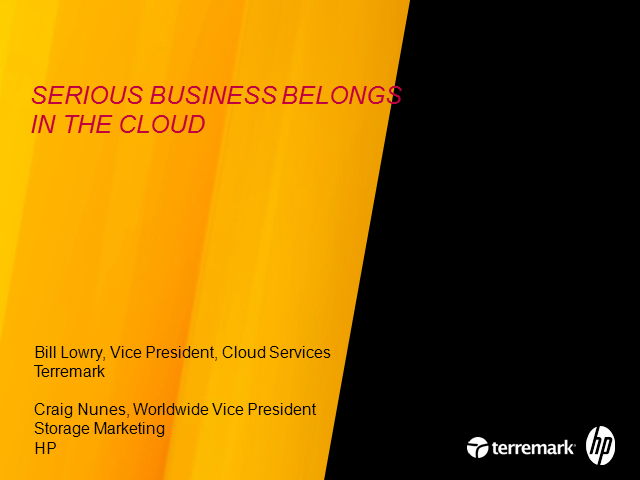 Join HP and Terremark to learn how enterprises are adopting the cloud for serious business. We will review real life examples and best practices from some of today’s most successful companies. We will also discuss the benefits and challenges associated with public, private and hybrid clouds as well as considerations for the appropriate business use cases for each. Terremark is a leader in managed hosting and IT infrastructure services, providing a wide array of businesses with unrivaled secured facilities, managed services, uninterrupted power, customer support and flexible data protection customized to individual business needs. HP storage transforms how information is stored, protected and managed to deliver new levels of simplicity, scalability and economic efficiencies. With HP's Converged Infrastructure as the foundation for Terremark’s cloud solutions, your business is ready for what's next.